One of my favourite books is Dodie Smith's I Capture the Castle, a tale of a family living in a crumbling manor house seen through the eyes of the youngest daughter. We Have Always Lived in the Castle is similar and has the whimsy displayed throughout I Capture the Castle, but only until the end of the first paragraph, which concludes with the line: "Everyone else in my family is dead." Mary Blackwood, known as Merricat, lives in the Blackwood family home with her older sister Constance and their Uncle Julian. The rest of her family are dead, killed by poisoning. Constance was accused and cleared of the crime, but that doesn't stop the villagers hating the Blackwoods. While Constance shuts herself in the Blackwood family manor, Uncle Julian constantly revisits the day the rest of the Blackwoods died, trying to piece together what happened. And then, one day, Cousin Charles arrives, and everything changes. 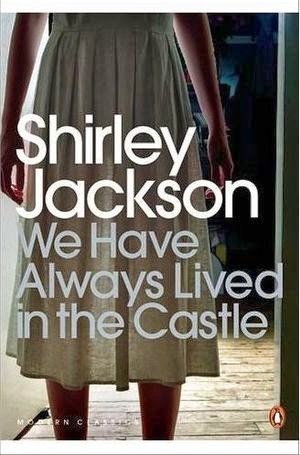 I'd never heard of Shirley Jackson before I picked up We Have Always Lived in the Castle, and I'm a little ashamed of that fact. This book is eerie and full of mystery and suspense, all overlaid with a hint of danger and something a bit otherworldly. Told in first person, the reader gets to know Merricat fairly well. I say fairly, because she's still an enigma. Independent enough to stand up to the villagers who hate her and her family, at the same time Merricat acts like a child with Constance, letting her older sister baby her. And as we learn more about Merricat, we learn that she can be both extremely protective, and extremely hateful. Constance, seen as a murderess in the eyes of many, is seen as a heroine in Merricat's eyes, and as a nurse in the eyes of Uncle Julian, who has never fully recovered from almost being poisoned along with the rest of his family. While Constance spends her days playing the perfect domestic goddess (cooking up swathes of beautiful food even though it was supposedly her cooking that killed her family), Uncle Julian alternates between lucid and not, trying to pin down every detail of the day he was almost killed. Once Cousin Charles arrives, the household gets even more bizarre. Merricat's little rituals of burying things and of routines become more and more like witchcraft, while the politeness Constance shows Cousin Charles makes the situation even more tense. And when it all comes to a head, with the villagers and Cousin Charles and Merricat and Constance and Uncle Julian, the consequences are both tragic and very, very strange. We Have Always Lived in the Castle is a compact novel crammed full of sinister delights. If, like me, you've never read anything by Shirley Jackson before, this is a great place to start. I have bee wanting to read this book for many years yet other books keep getting pushed in front of it! I went to netgalley to see if they have it there but they didn't so I am going to get it from the library! I adored this book, and like I said in my review, I'd never heard of Jackson before. I'll be hitting up my library to see if they have more of her stuff.